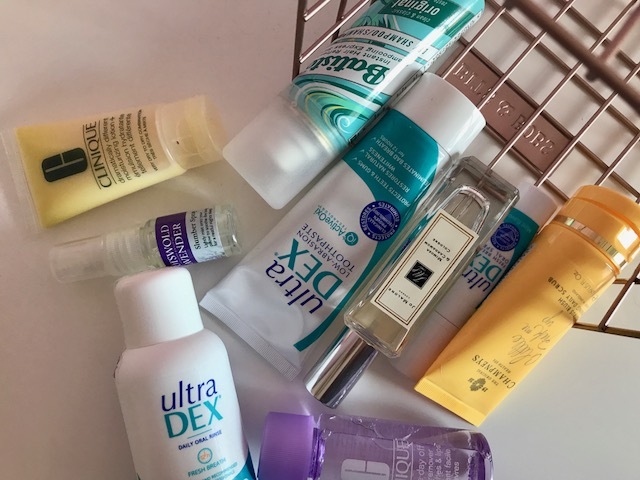 I am jetting off to sunny Spain in a few weeks so the inner organised me has been trying to burst out and start packing however, its still a little early so I thought instead I could share with you a few of the travel toiletries that will be coming along with me. We only have one suitcase between two of us so we need to make sure we don't over pack, so its minis all the way! 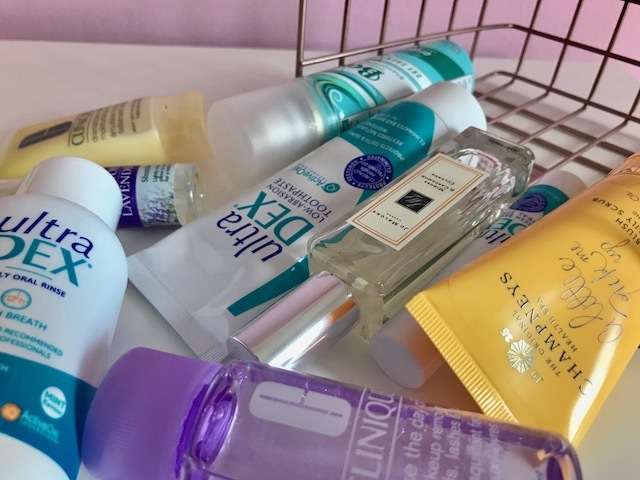 I usually keep a selection of minis within my toiletries collection as I prefer to take them if we go for a weekend away so I have a little stash that I use every now and again. usually within this is a few various shower gels the one I'm taking with me this time is this Champneys citrus one that I received in a gift set at Christmas. It is a lovely fresh summer scent perfect to take on holiday. I have my favourite Batiste dry shampoo that is a life saver as my hair can not deal with not being washed every day but lazy me doesn't want to wash it every day! This perfect size bottle is easy to chuck in my toiletries bag. FYI some airports make you remove aerosol lids when taking as hand luggage. 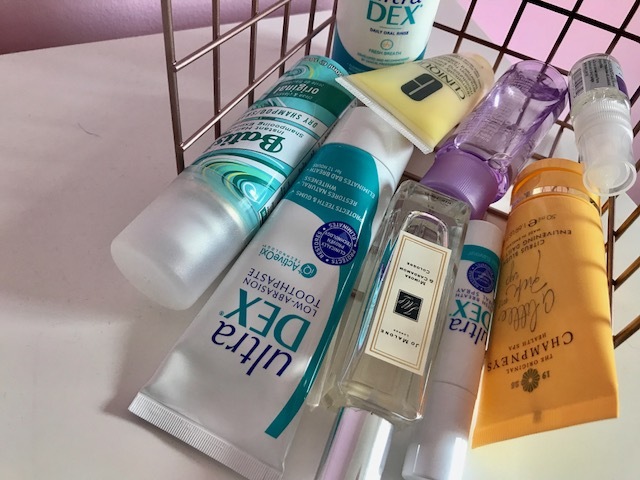 Other must have include my Clinique face care, I have been using Clinique for a few years now so I'm glad I can take the smaller options away with me rather than having to change or take the full size. I love the dramatically different moisturiser especially when my skin is dry this works a treat! Of course you cant go any where without taking your toothpaste, I love the Ultra Dex products as they come in the perefect travel size. 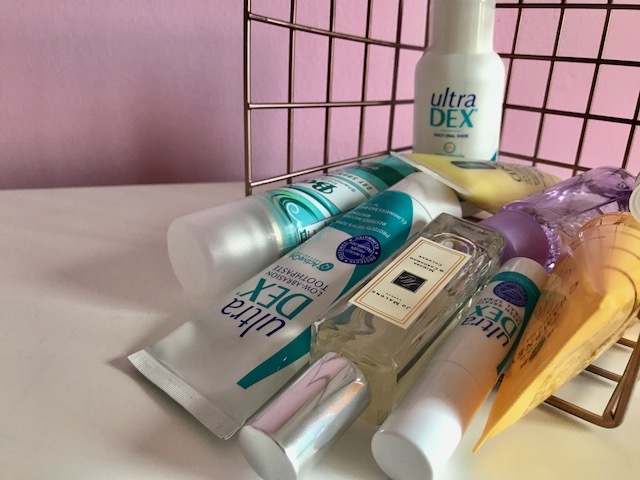 I have featured UltraDex on my blog before so you can read the full review here! I love the little fresh breath spray as it is so handy on a flight when you need a little freshen up! For those of you who fancy trying out the Ultra Dex products I am going to be giving some away on Twitter! So head there to be in with a chance. I hope this helps with your holiday packing! Im sure I will throw a whole lot more in to my toiletries bag before I head off but at least I have made a start. Don't forget to enter my twitter giveaway.